You live a healthy lifestyle. You eat the right foods (most of the time) and try to stay fit and active, but have you ever thought about what all those 3-inch heels and flat-footed flip flops are doing to your foot health? 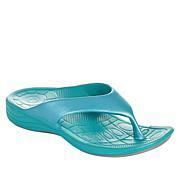 With Aetrex's built-in, orthotic footbed, beauty doesn't have to equal pain. These quarter-strap sandals also include a fully adjustable strap and anti-microbial technology for a truly enjoyable walking experience. I have trouble with my feet. Nerve pain and swelling. These are very comfortable and adjustable if my feet swell. Stylish too. 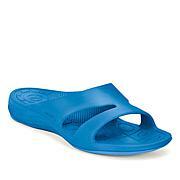 Very comfortable and I have a high arch that this sandal supports. Love the use of Velcro and the this soft sole. I highly recommend it to anyone. Sad to send this shoe back. It is well built, stylish and modern. If only it came in a much wider fit. Please bring this Aetrex Piper Braided Leather Sandal back in larger and much wider WW for the bigger gals. I am hard to impress when it comes to shoes, but right now Im on board. These required no break in time. I have plantar fasciitis and not pain all day. That is a win! It may not be made of glass, but this fairy tale-inspired sandal is still one-of-a-kind. Bedazzled and bejeweled to befit the prettiest of princesses, the orthotic footbed design and easy slip-on style make it perfect for any modern-day maiden. The Jules is an upgraded flip-flop style with ornate rhinestone and bead embellishments for a more feminine look. With superior comfort features like a water-friendly construction and 'Healthy 3' orthodic design, this summer style is perfect for long walks on the beach.